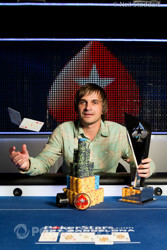 Congratulations to Mikalai Pobal, Winner of the 2012 PokerStars.com EPT Barcelona Main Event (€1,007,550)! The 2012 PokerStars.com European Poker Tour Barcelona Main Event concluded on early Sunday morning as Mikalai Pobal topped a field of 1,082 players to capture the €1,007,550 prize. Prior to the win, Pobal’s only live cash was a 104th-place finish at the EPT Berlin Main Event back in April for €7,500, while his best online score on PokerStars, where he plays under the name “leanod,” was a third place finish in the Sunday Million. Needless to say, the young Belarusian, who studied International Economic Relations at Belarus State Economic University, won life-changing money in the first EPT Main Event of Season 9. The day got off to a fairly quick start. On Hand #11, action folded around to Samuel Rodriguez in the small blind and he out in a raise to 180,000 with . John Juanda was in the big blind and thought a long while before moving all in for 1.665 million with . Rodriguez thought even longer, but eventually made the call. The flop was safe for Juanda, while the turn made the no good for Rodriguez. With that said, the latter picked up counterfeit options, meaning a seven on the river would give him eights and sevens with an ace kicker. Much to the shock of the crowd, the spiked to put an end to Juanda's tournament in eighth place. A short time later, Anaras Alekberovas opened for 190,000 under the gun and was met with a three-bet to 450,000 by Antonin Duda, the economics student from Jablonec, Czech Republic who qualified for the tournament via a €22 re-buy event on PokerStars. Alekberovas pushed back with a four-bet to 800,000, Duda moved all in for 2.56, and Alekberovas snap-called. It was the second time Alekberovas had picked up kings, and while the flop paired Duda's ace, it also delivered the Lithuanian a set. Neither the turn nor river would help Duda, and the Day 3 chip leader was eliminated in seventh place. In the first hand back from the break, Sinel Anton raised to 205,000 from early position with and was met with a three-bet to 375,000 from Alekberovas, who held in the cutoff. After the button and blinds folded, the short-stacked Anton just called. Not only that, he check-called bets of 100,000 and 205,000 on the flop and turn respectively. Anton checked for a third time when he paired his queen on the river, and then called off his last million when Alekberovas moved all in. Anton seemed to think he won the hand as he lingered at the table until someone told him, "You lost." Anton realized the situation and took his leave in sixth place. In the very next hand, Joni Jouhkimainen, who began the final table as the short stack, and Rodriguez created a 1.1 million pot preflop and saw a flop of . It was an action flop as Rodriguez flopped two pair holding and Jouhkimainen had an up-and-down straight draw with . Rodriguez's last 2.32 million ended up in the pot and the players were on their feet, especially when the turn gave Jouhkimainen an added flush draw. Much to the dismay of Rodriguez and those hoping to see a Spaniard take down an EPT for the first time, the spiked on the river to complete Jouhkimainen's flush and increase his stack up to 11.1 million; meanwhile, the local player exited the stage in fifth place to a nice round of applause. It took over three hours for the next elimination to occur, but happened when Jouhkimainen raised to 325,000 from the button, Pobal folded and Alekberovas re-raised to 725,000 from the big blind. Sahamies got out of the way and Jouhkimainen four-bet to 1,175,000. Alekberovas announced an all-in and Jouhkimainen called. The Lithuanian was in for 4,535,000 along with his tournament life. Jouhkimainen's kings were in good shape against Alekberovas' nines, which needed some major help from the board. None came on the flop, and the turn no help. It was down to the river for the Lithuanian, but the useless appeared. 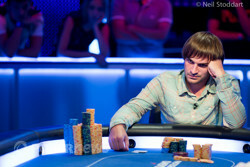 Alekberovas was eliminated in fourth place collected €301,750 for the biggest tournament prize of his young career. Things slowed considerably after that, and it took another three hours before the next elimination—Jouhkimainen. The young Finn had an interesting day as he started on the short stack and ran it up to amass nearly 75% of the chips in play. Unfortunately for him, he would be whittled back down in three-handed play against Sahamies and Pobal. In what would be his last hand, Jouhkimainen opened his last hand with a raise to 500,000 from the button with only to have Sahamies shove all in from the big blind holding . Jouhkimainen snap called and the two Finns went for a showdown. 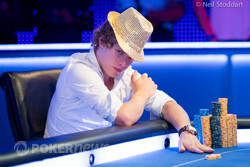 The flop paired Shamies' ace and put Jouhkimainen on the verge of elimination. The on the river left him with only two outs, but the on the river wasn't one of them. Jouhkimainen was eliminated from the tournament in third place, while Sahamies entered heads-up play with 12.175 million to Pobal's 20.2 million. The stacks suggested it might be a long haul to the finish, but nothing could have been further from the truth. From there, it didn’t take long to for Pobal to finish the job as he eliminated Sahamies in second place with when the Finn’s shoved with . The board ran out , and that was all she wrote. Congrats to Mikalai Pobal on winning the 2012 PokerStars.com EPT Barcelona Main Event. The next stop on the EPT schedule is Sanremo, which will take place from October 5-11. The PokerNews Live Reporting Team will be on hand for that event, so be sure to check out our live reporting section then for even more EPT action. The celebration is still going on here at the Casino Barcelona. Stay tuned for our recap of the day's action. On the button, Ilari Sahamies raised to 600,000 with the . Mikalai Pobal reraised to 1.6 million from the big blind with the and received a massive treat when Sahamies moved all in for 10.485 million in chips. Pobal snapped and tabled his hand as quickly as possible to show Sahamies the bad news. The flop only made things worse for Sahamies when the fell. Sahamies was now in need of a runner-runner miracle, but after the landed on the turn, he was officially drawing dead. The river completed the board with the and officially ended the tournament. For his finish, Sahamies earned €629,700. He quickly left the stage while Pobal celebrated the victory with his rail. From the button, Ilari Sahamies raised to 600,000. Mikalai Pobal called from the big blind and the flop came down . Pobal chcked and Sahamies checked behind. The turn was the and Pobal led for 650,000. Sahamies raised to 1.55 million and Pobal called to see the land on the river. Both players checked. Sahamies showed the for jack high and Pobal held the for flopped trips. Pobal held the best of it and scooped in the pot. On the flop, Mikalai Pobal checked with the to Ilari Sahamies holding the . Sahamies fired 550,000 and Pobal called. Following the flop action, both players then checked the turn card and river. Pobal opened his hand and scooped in the pot with the best two pair, queens and sevens. 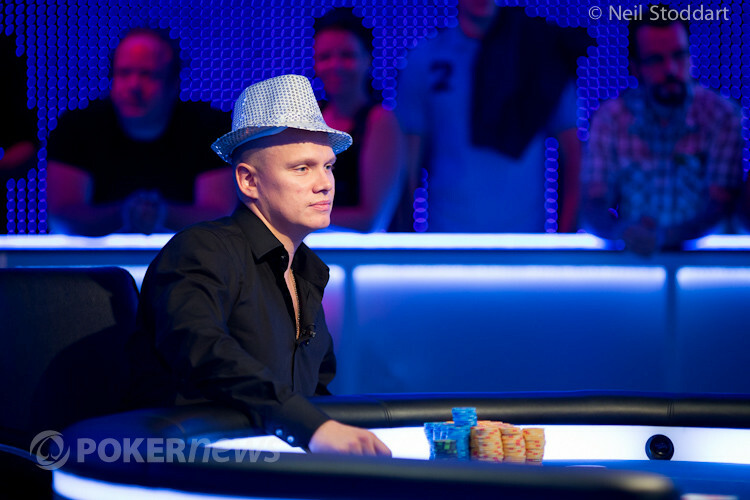 Joni Jouhkimainen was the short stack coming into the final table, but managed to build it up and had nearly 75% of the chips in play when the tournament was down to the final four. However, the three-handed play finished with the elimination of the young Finn, who will collect a cash prize of just over €400,000. Jouhkimainen opened his last hand with a raise to 500,000 from the button with only to have Ilari Sahamies shove all in from the big blind holding . Jouhkimainen snap called and the two Finns went for a showdown. The flop paired Shamies' ace and put Jouhkimainen on the verge of elimination. The on the river left him with only two outs, but the on the river wasn't one of them. Jouhkimainen was eliminated from the tournament in third place leaving the two remaining players, Ilari Sahamies and Mikalai Pobal heads up for the title. With 1.21 million in the pot and a flop of , both Mikalai Pobal and Joni Jouhkimainen checked to see the turn. This time Pobal bet 675,000 from the big blind with , Sahamies called from the button with his , and the turned. Pobal bet a million, and Sahamies opted to call with ace-high. It was no good and Pobal was pushed the pot. It was an unusual sight to watch all three players go into the flop. With 810,000 already in the pot and the board reading Ilari Sahamies bet 400,000 from the small blind holding . 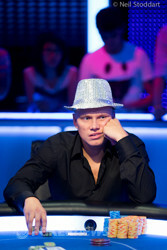 Joni Jouhkimainen folded and Mikalai Pobal raised to 1,200,000 with . Sahamies made the call and the dealer opened on the turn. Sahamies checked and Pobal fired 2,200,000. Sahamies didn't go along and mucked his hand. Who Will Become the 2012 PokerStars.com EPT Barcelona Main Event Champion?